There are three major rules to understand about 1031 exchanges. 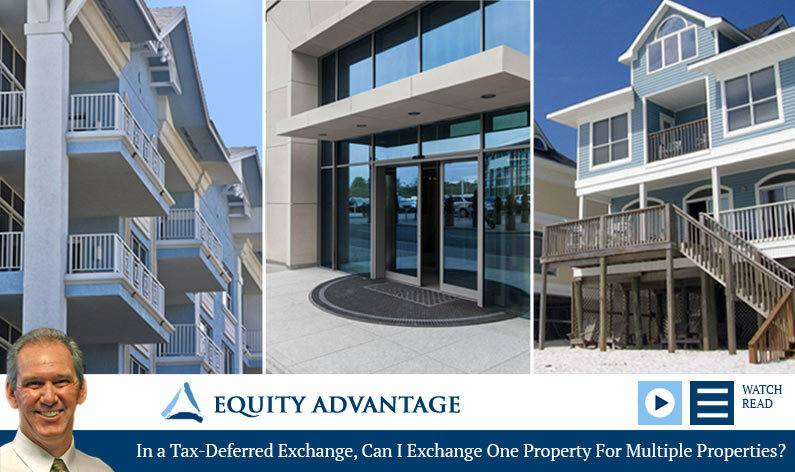 David Moore of Equity Advantage looks at those rules and the possibility of exchanging out of one property into multiple properties. Understand the rules and the way an exchange expert can help you navigate the pitfalls so you can stay on track and out of trouble. Can I Exchange Out of One Property into Multiple Properties? I think this issue is probably one of the big misunderstandings in the code, and the answer is dictated by the identification rules. There are three different identification rules. Anyone who has been through a 1031 exchange probably is aware that timeline and ID rules are the biggest headache with any transaction, but each ID rule works independently of the others. The first ID rule says you can ID up to three properties of any value, which is pretty self-explanatory. The second rule says you can ID more than three properties, and the total value of the properties can’t exceed 200 percent of the relinquished property’s value, meaning you have to look at what’s a property worth. People wonder whether the property has to be on the market to be considered something to be identified, and I get a kick out of that question because if you go back into 1990, let’s say, and look in the audit manual from that time, one of the questions was, “Was the property listed at the time of identification?” This is totally irrelevant. Does a property have to be listed to be purchased or sold? Of course not. The third rule is that you can exceed three properties and you can exceed 200 percent of that relinquished property in value, but you have to close 95 percent of the aggregate value of all properties identified. This basically means you will have to close everything that’s been identified. Not many people want to work with that, but it is a possibility. Typically it’s going to be a situation where I will encourage people to just get the deal done inside the 45 days. We had a client years ago who bought 24 different replacement properties and closed them all inside the 45-day ID period, which is certainly the safe way to do it. She was a CPA. She understood the repercussions of a failure in that situation. To review: there’s the three-property rule, the 200 percent rule, and the 95 percent rule. You can do anything you want as long as you get it done inside that 45 days. So there is no limit to what you can buy—it’s wide open. It really comes down to how hard you want to work to make things happen, and how well you want to sleep at night, I guess. How Can a 1031 Exchange Expert Help Me? A 1031 expert—an accommodator, a facilitator, an intermediary—is paid a fee to take part in a transaction. We don’t work in an agency capacity with somebody. We’re paid a fee to handle that transaction. An exchange expert is really going to do their best to keep you out of any potential problems, to make sure to take a look at what that transaction entails. We want to know what’s going on when we first talk with you—what you’re giving up and where you want to go. We are going to do whatever we can to minimize the time constraints and the problems with the time constraints. We also stay alert for things like seller carryback and changes in vesting. We look at those issues to help you get on track sooner rather than later. It all comes down to when we hear about that transaction. If you give us a call and the property is closing today, we can probably get the transaction done, but we won’t have much time to fix anything. If you give us some time, we can take a look at the deal, understand your objectives, and really make sure we’re doing everything possible to get you where you want to go.